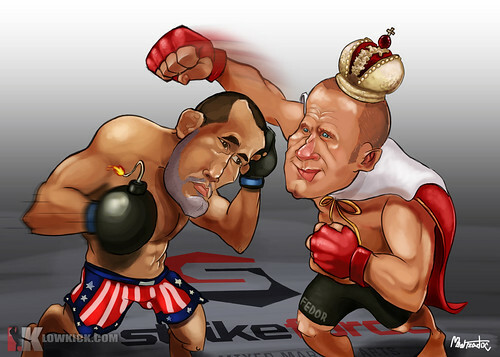 MMA Junkie reports that 8,311 fans attended Saturday night’s Strikeforce event for a gate of $638,470. The event took place at the Sears Centre Arena outside of Chicago. This year’s Chicago-area show featured a heavyweight headliner between MMA legends Dan Henderson and Emelianenko. Thanks largely to that super-fight, most tickets were sold more than a week before the show, which Coker suggested was the most talent-rich in the organization’s history. In comparison, June’s Strikeforce event, Overeem vs. Werdum, held at the American Airlines Center in Dallas had 7,639 in attendance for a total gate of $543,060. The main event is likely what everyone came to see and the action did not disappoint. We will leave it up to you to determine whether the fight was stopped too early. It will be interesting to see what will happen next to both Fedor and Henderson. If Fedor is cut from Strikeforce, it will have dismissed the two fighters it had hoped would meet in the finals of its Heavyweight Grand Prix. How ironic. With Overeem being cut from the organization and Fedor on a losing streak, Dan Henderson arguably is the face of Strikeforce. Yet, at 40 (41 August 24th), it seems like Henderson should be back in the UFC. There are a lot of interesting matchups that Zuffa could make if Henderson came back. But, that would mean another Strikeforce fighter vacating their title to jump to the UFC. Would Zuffa allow that to happen? Rashad Evans appeared on NBC’s Late Night with Jimmy Fallon Friday night to promote next week’s showdown with Tito Ortiz. Unlike most athletes, Evans was personable and seemed genuinely comfortable trading barbs with Fallon. Despite an awkward impromptu karaoke spot, Evans rolled with Fallon’s schtick and provided some great impressions of his mom and Randy Couture. A link to the appearance is here. Despite UFC 133 suffering from a plethora of fighter injuries, the main event has two of the better faces for the UFC. Ortiz is Tito Ortiz and Evans is well-spoken and proves here to be a likeable guy. His work on ESPN’s MMA Live has probably helped. Jimmy Fallon’s show has had multiple WWE and UFC fighters and its one of the few late night spots where a UFC fighter has time to talk (and joke – recall Lesnar choking Jimmy out) with Fallon. It also gives fighters the chance to be more than the stereotypical fighter (as portrayed in most commercials they star in). In addition to Evans’ Yahoo! spot, promotion for UFC 133 is going strong despite a card that has had multiple replacements. Rich Franklin is featured in a Boost Mobile commercial entitled, “Bring a UFC Fighter to Work.” Guess who plays the UFC Fighter. I must admit that I had hoped Franklin would show more acting prowess in the commercial. Franklin actually starred in a movie with Tiffani Thiessen called “Cyborg Soldier.” He plays the Cyborg although Thiessen’s character may be a love interest in the movie. Recently, Franklin’s life story was purchased by a movie production company. It appears that Franklin’s next career move after the UFC will be in the movies. As for the Boost Mobile promotion, its a unique contest that will draw fans to its facebook page. The prize essentially is meeting a UFC Fighter under the guise that one would bring them to work to enforce workplace annoyances. DALLAS (July 29, 2011) – HDNet’s “Inside MMA” breaks some shocking news concerning StrikeForce™ Heavyweight champion Alistair Overeem who “Inside MMA” has learned has received a cut letter and has been released from the promotion. Overeem has fought through nagging injuries, and even though he was set to fight in the StrikeForce™ semi-finals (scheduled for September 10th in Cincinnati), Overeem has stated he still needed more time to recover. Overeem will fight in Russia in October for the promotion United Glory – no word yet on who his opponent will be. For more on this breaking story follow “Inside MMA” on Twitter (twitter.com/hdnet) and Facebook (http://www.facebook.com/HDNetInsideMMA). MMA Mania reports that Anderson Silva has signed a sponsorship deal with Burger King to represent the Whopper-maker in Brazil. We will likely see the BK on Silva at UFC Rio next month. Anderson has a great identity with the brand, is an idol of many audiences, especially young people, our main customers. We believe he has much to contribute to make the new campaign more fun and impactful. The Burger King sponsorship is ironic considering Silva admitted the guilty pleasure of sneaking a Big Mac close to fights. This was due in part to the fact that he used to work at McDonalds. Silva is reaping the endorsement dollars of being champion. Earlier this year, Silva signed a deal with Bozzano which paid him a reported $100,000. We do not have any dollar amount on the the Burger King sponsorship yet but the fact that Silva is attracting a mainstream sponsor shows the amount of popularity he has in his native Brazil. ProElite announced today that they would be revealing more details on their “ProElite 2.0” 8/27 event during a conference call this Friday morning. LOS ANGELES, CA–Jul. 26, 2011— ProElite, Inc. (PELE:PK), today announces a press conference scheduled for Friday, July 29th in Honolulu to reveal the matchups on the upcoming August fight card. ProElite’s August 27 event from Hawaii has been building up nicely in the past couple of weeks. T.Jay Thompson and Rich Chou have done a great job of piecing the card together with a good mix of recognizable veteran names along with young prospects. The additions of Kendall Grove, Reagan Penn, and Kala Hose to the card should translate into good attendance numbers for the promotion. Young prospects such as Mark Ellis and Sara McMann will bring credibility to the promotion and should begin the process of creating their own stars. Sources have informed MMAPayout that the event will most likely be streamed from Sherdog.com as the UFC Rio event concludes. Another interesting piece of news is that Jens Pulver is in talks to become ProElite’s color commentator for the event. Legendary PRIDE referee Yuji Shimada will also be working the August ProElite event in Hawaii. In terms of sponsors, ProElite’s T.Jay Thompson informed us that he didn’t expect any major sponsors for this event. If we look at the event poster, it only shows radio stations such as 101.9, 98.5, and 93.9. MMAHAWAII.com will be streaming the press conference live. SafeAuto Insurance is offering fans a chance to win a trip to UFC 133 if it likes them. When fans “like” SafeAuto’s Facebook page and fills out a contest form they will be entered into a contest to win a prize package including tickets, hotel and airfare. One of the biggest moving MMA sponsors this year has been SafeAuto Insurance. From its sponsorship of fighters, to its sponsorship within the octagon, to a commercial featuring Clay Guida, SafeAuto has taken advantage of its investment in MMA and the UFC. Its latest form of brand activation is a contest for UFC 133 which involves a social media aspect by having contestants go to its company Facebook page and “like” it prior to entering. It will be interesting to see the number of likes it will receive as a result of the contest. What will be more interesting is the type of content SafeAuto will have on the Facebook page once contestants are drawn there and is the intended purpose to have people come back to its Facebook page. SafeAuto Insurance offers state minimum coverage car insurance in only a handful of states so its target audience of potential consumers is limited. ” I can confirm that we will be having our camera crew at UFC 133 getting behind-the-scenes footage of the contest winners as they get to go to the weigh-in and be in Philadelphia for the weekend. There are some other exciting announcements coming up so stay tuned.” In addition to its main page, SafeAuto also has a microsite and MMA Facebook page.